Machynlleth (or 'Mac') with its broad high street and colourful buildings is just four miles away. 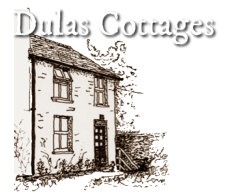 It's an ideal centre for your holiday in the heart of Wales. You'll enjoy Machynlleth's varied shops, cafes and other facilities such as the Museum of Modern Arts but the town also has a sense of history. Wednesday is market day, and has been for many years under a charter granted in 1291. Owain Glyndwr was crowned Prince of Wales here in the Spring of 1404 before leaders from Scotland, France and Spain. In more recent times, slate from quarries around Ceinws came down to Machynlleth on the Corris Railway for onward shipment. Thanks to restoration work by dedicated volunteers, part of the railway now carries passengers again).